In a survey of British driving licence holders, aged 18-84, around 84 per cent of respondents said they didn’t know what the new sentencing guidelines – which come into force on 24 April - meant, while more than half (56 per cent) were completely unaware that the penalties for speeding were changing. 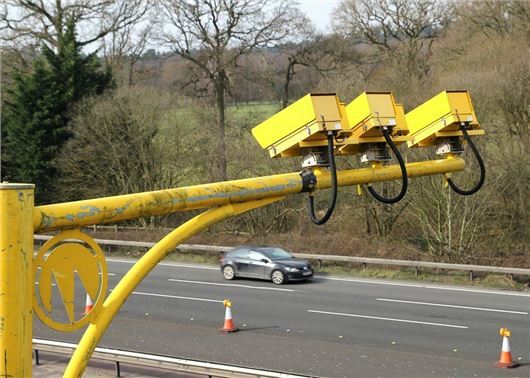 Fines for the most serious cases of speeding will rise by 50 per cent in England and Wales, following a Government review of sentencing guidelines for magistrates’ courts. The new rules will allow magistrates to convict the most serious offenders with a fine starting from 150 per cent of their weekly income, an increase of 50 per cent over the previous guidelines. Fines will be capped at £1000 for most roads, but rise to £2500 for those caught travelling over 101mph on the motorway. The updated Band C sentencing rules will affect drivers caught doing 41mph or more where there is a 20mph limit, 51mph or more where there is a 30mph limit or over 101mph on a motorway. Drivers prosecuted for doing 9mph over a 20mph or 30mph limit will be liable to three points and a band A fine, starting from 50 per cent of their weekly income. The new guidelines for magistrates' courts are intended to provide a 'clear increase in penalty as the seriousness of offending increases', according to the Sentencing Council. More money for the governments coffers. They could improve road safety by actually filling in a few pot holes if they wanted to. i though the conservatives were on the side of the motorist? No government has been on the motorists side. Where a ATM as far as their concerned. These rules are good in principle, provided that the speed limits are sensible. A 20mph speed limit on a 2-lane road with no parking bays either side, makes absolutely no sense. Good I am glad to see that speeding is being treated more seriously. The difference between a pedestrian being hit at 20mph and 40mph is very large. More needs to be done to reduce speeding, especially in our residential areas. Just stop and think, how would you feel if you knocked someone over. We need to take a more serious look at speeding in urban areas. The law on speeding in this country is outdated. We need to have a real overhaul. How can it be possible for a 44 ton artic to be allowed to do the same speed past my children's school as a Porsche 911 which could stop on a 2p piece? Also if speed cameras are to be seen as less of a moneymaker for the government and an actual safety device as we are told then why do we not have one set to 20mph outside all schools and adjacent to pedestrianised areas. 70 mph on an empty motorway is ridiculous also, dynamic speed limits set according to the conditions, whilst more complex to enforce would be a far better way of doing things. In my opinion. Completely disproportionate. A driver holding a mobile gets off more or less Scott free. A driver on an empty 3 lane carriageway gets 2.5k. Gouging. Nothing more, nothing less. 2.5k for driving past a school on a mobile would make far more sense. Does these new sentencing guidelines apply only to speeding cases brought before the magistrates ? Have the fixed penalty 'prosecutions' from fixed point speed cameras ie. £60 and 3 points been retained ? these new rules are specifically aimed at irresponsible drivers going well over the speed limit and so every sensible person should be in favour of the increase in penalties to keep our roads safer There is little change to "normal" speeding fines but put simply, if you don't exceed the speed limit you won't have anything to worry about with these new penalties. "In a survey of British driving licence holders, aged 18-84, around 84 per cent of respondents said they didn’t know what the new sentencing guidelines – which come into force on 24 April - meant, while more than half (56 per cent) were completely unaware that the penalties for speeding were changing." Well, yes, but what's the problem? Do motorists really carefully consider their speed and calculate that they can afford to do 40 in a 30 zone, but can't pay the fines to do 50? It seems to me that the major increases are for those travelling as outrageously excessive speeds, and are possibly not high enough. I'd impound vehicles for a few months too. Having been caught allegedly doing 39 in a 30 limit, I went on the driver awareness course to avoid points. This is the first time I have been caught speeding in 57 years of driving. I am now very careful BUT, what is the point in manufacturers producing vehicles capable of 150 plus MPH when the most you can do in this country is 70 MPH? Not only do they guzzle gas they are lethal. Now that I am in full swing, I do not believe that there is a single speed camera on the M25. If there were, the government could wipe out the national debt within a year. What does Honest John think? Sorry - Finger Trouble. Didn't mean to comment twice. The ostensible reason for this is to reduce the "carnage" on our roads. What carnage? 85 years ago In 1931, with only 1.1m. vehicles on the road, the number of fatalities was twice what it is today, when nearly 30m. vehicles are running around at much higher average speeds than before the war. This represents an almost unbelievable improvement in road safety: the wonder is that casualties are not in the tens of thousands per annum. The real reason for these measures, of course, has very little to do with safety and everything to do with raising large sums of money- cash which you can bet your bottom dollar will NOT be spent on repairing roads and filling potholes. A few years ago, a respected safety organisation, the Institute of Advanced Motorists, established, through rigorous analysis of detailed police accident records, that inappropriate speed was the key factor in only 13% of incidents involving loss of life or serious injury, and that 85% was down to driver error. A speaker at a speed awareness course, when questioned on this, admitted in my hearing that the driver error percentage was probably nearer 95%. Speed is therefore a minor cause of serious accidents, but remains the only one the authorities can exploit to raise revenue. Driver error, overwhelmingly the main cause, can only be reduced by long and enormously expensive education programmes for which the government would have to pay huge sums. That's why it doesn't happen. Instead, the speed penalty cash registers are going into overdrive with the announcement of these latest measures. Speeding fines do need to better reflect the importance of safer stopping distances at lower speeds but the extent of this increase goes from the 'sublime to ridiculous'. My particular bugbear - 20 mph limit on ALL roads in Islington; certainly vaild on narrow residential roads but on the main roads it is very difficult to adhere as my car engine really struggles to cope other than in 2nd gear and other impatient (and wealthier?) drivers tailgate me. I must say, that a lot of money has gone to putting speed bumps and restrictions on our roads. There is no need to break any speed limit at any time although a lot of limits seem to be to low or to high on certain parts of the roads. I was in conversation with a chap that complained that he got caught doing 40 in a 30 limit when no other cars were around, he said he thought that was a safe speed on an empty road! I then pointed out that another person might think 50 was safe on the same road. He said that was a bit fast. To this I said that's why we have speed limits otherwise we would all do silly speeds and the is just madness. Sort your lives out whoever comes up with these figures/rules obviously doesn't drive on the UK roads anymore.